Archosaurs showed dramatic changes in their posture and these are reflected in the two living groups. Crocodilians are essentially, though secondarily, like their sprawling Triassic ancestors, whereas birds stand fully upright, or erect (illustration). 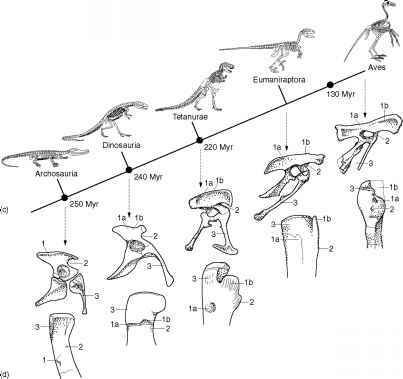 The key changes happened largely in the Triassic. Early Triassic archosaurs such as Proterosuchuswere sprawlers. Sprawling is the standard reptilian posture, in which the limbs are directed sideways and the body is held only a little way off the ground. Some later archosaurs, such as Euparkeria, probably had a semi-erect posture, in which the body could be hoisted clear of the ground during walking. The fully erect posture, in which the limbs are tucked beneath the body and the whole length of the limb operates to produce a stride in the vertical plane, appeared, possibly several times, in different Late Triassic archosaur groups: ornithosuchids, rauisuchians, early crocodylomorphs, pterosaurs and dinosauromorphs. The erect posture also arose independently during the Triassic in the cynodonts (see p. 292), and it is seen in their descendants, the mammals. Why the change? Advantages of an erect posture are that more of the limb is used in walking or running and stride length is increased. Also, having the limbs tucked beneath the body means that erect animals can more readily support their body weight. When a sprawler lifts its belly from the ground, its elbows and knees are subject to intense bending stresses. An erect animal, such as an ostrich or an elephant, can support its body weight with much less stress as the upper and lower elements of the limb are more in line. In the switch from sprawling to an erect posture (illustration (a, b)), muscle forces changed and these can be seen in a comparison of living crocodilians and birds, and in the fossils (Hutchinson and Gatesy, 2000). When a sprawler is standing still, its body is liable to collapse. This forces the knee joint up (abduction) as the body goes down and the tendency is opposed by the adductor muscles that lie beneath the limb, running from the pubis and ischium to the underside of the femur. In erect animals, on the other hand, the tendency is for the femur to move in towards the midline (adduction), so this is opposed by muscles above the limb, the iliotrochanteric (iliofemoralis) muscles, which extend from the posterior part of the blade of the ilium to the dorsal surface of the femur, attaching on the fourth trochanter. In walking, sprawlers swing the femur through a wide arc and the retraction ('backwards pull') phase of the stride is powered by the large caudifemoralis muscle, which attaches all down the side of the tail and runs to the posterior margin of the femur. Birds, on the other hand, have tiny tails, a somewhat reduced caudifemoralis muscle and most of their stride is composed from rotation of the femur along its long axis and movements at the knee powered by 'hamstring' muscles that run from femur to tibia and below. continued became more involved in lateral rotation of the femur. Then in birds and close relatives, the pubis moved back dramatically, also moving the origin of the PIFE backwards. This cut out the muscle's function in protraction of the femur and allowed it only to produce retraction and rotation of the femur. Ischigualasto fauna and was large enough to make a succulent meal. True crocodilians arose in the Early Jurassic (see pp. 232-7), but there were a number of close relatives in the Late Triassic. Some of the Late Triassic crocodylomorphs seem most uncrocodilian at first sight. An example is the saltoposuchid Saltoposuchus (Crush, 1984) from South Wales, a lightly built, delicate animal 0.5m long (Figure 6.4(a-c)). It has a long skull with slender pointed teeth and long hindlimbs that suggest it was a biped. It probably fed on small reptiles, insects and other invertebrates. (hip socket). In addition there are a number of crocodylomorph specializations in the skull (Figure 6.4(b)): the quadrate and quadratojugal are displaced inwards towards the braincase and the cheek region is overhung by the squamosal. tic analyses, but Clark and Sues (2002) suggest that 'sphenosuchians' are paraphyletic with respect to later crocodylomorphs. The archosaurs were the main group of archosauro-morph diapsids to rise to prominence in the Triassic, but there were three other groups. Trilophosaurus from the Upper Triassic of Texas (Gregory, 1945) has an unusual heavily built skull (Figure 6.5(a, b)) with broad flattened teeth that were used for shearing tough plant food. The trilophosaurids are unusual diapsids as they have lost the lower temporal opening. On the basis of numerous other characters, it has to be concluded that the lower temporal opening closed secondarily. faunas where they were often the dominant herbivores, representing 40-60% of all skeletons found (see Box 6.3). Early forms (Dilkes, 1998) were small, but Late Triassic rhynchosaurs such as Hyperodapedon (Benton, 1983b; Langer et al., 2000) were up to 2 m long. Hypero-dapedon has a deep cheek region composed mainly from the jugal and maxilla, and the premaxillae extend forwards and downwards as rounded and pointed elements (Figure 6.5(c)). The lower jaw is also deep and the dentary bears two rows of teeth, one on the crest and the other lower down on the inside (Figure 6.5(d)). The skull is triangular in plan view (Figure 6.7(e)). The back of the skull is broader than the total length, and this vast width seems to have provided space for strong jawclosing muscles. There are broad tooth plates on the maxillae in the palatal region that bear several rows of teeth on either side of a midline groove. The lower jaw clamped firmly into the groove on the maxilla, just like the blade of a penknife closing into its handle (Figure 6.5(f)). This kind of jaw action, with no sliding back and forwards, or from side to side, is the precision-shear system, just like a pair of scissors. Rhynchosaurs were herbivores that fed on tough plants, possibly seed-ferns. Hyperodapedon has massive high claws on its feet (Figure 6.5(g)) that were probably used for uncovering succulent tubers and roots by backwards scratching. The fourth group of archosauromorphs, the prolac-ertiforms, had appeared first in the mid-Permian, represented by Protorosaurus (see p.119),and they radiated in the Triassic. Most of the Triassic forms probably looked like lizards, but by the Mid-Triassic, one of the most unusual reptilian lineages had arisen within this clade. Prolacertiforms are characterized by long necks, but that of Tanystropheus from Central Europe (Wild, 1973) was extraordinary, being more than twice the length of the trunk (Figure 6.5(i)). The neck was not greatly flexible as it is composed of only 9-12 cervical vertebrae. Each of these bears long thin cervical ribs that run back beneath the backbone and may have provided attachments for powerful neck muscles. Juveniles of Tanystropheus have relatively short necks and, as they grew larger, the neck sprouted at a remarkable rate. Its function is a mystery. The sharp teeth (Figure 6.5(h)) suggest that Tanystropheus fed on meat (fishes and cephalopod hooklets are known as stomach contents), whereas the limbs and other features may indicate a life in the water. Indeed, many of the specimens are found in marine sediments, and Wild (1973) reconstructs Tanystropheus as a coastal swimmer that fed on small fishes that it caught by darting its head about. The trilophosaurids, rhynchosaurs and prolacertiforms all died out in the Late Triassic, the rhynchosaurs and many of the prolacertiforms well before the end of the period, about 220 Myr ago, and the others right at the end of the period. These three groups and the archosaurs belong to the Archosauromorpha, one of the main divisions of the Diapsida (Benton, 1985; Evans, 1988; Laurin, 1991; Dilkes, 1998). 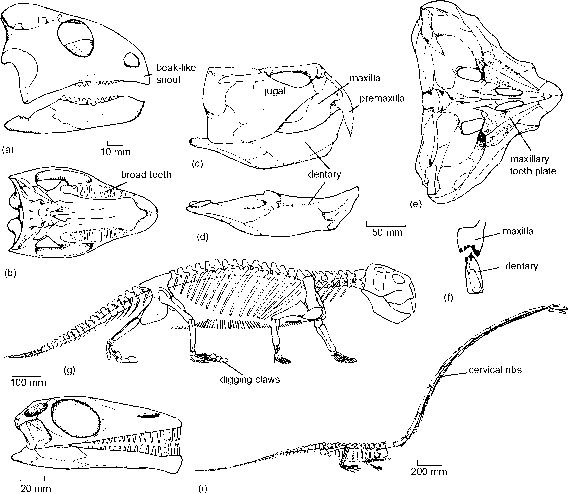 The prolacertiforms and archosaurs are sister groups (Figure 6.6), sharing many characters, such as a long snout and narrow skull, long nasal bones, backwardly curved teeth and long thin cervical ribs. Dilkes (1998) found that the prolacertiforms split into two clades, Prolacerta, lying close to archosaurs in the cladogram, and the remaining prolacertiforms closer to the base of Archosauromorpha. The phylogenetic scheme shown here (Figure 6.6) is very different from older views (e.g. Romer, 1966). Rhynchosaurs and prolacertiforms were regarded as true lepidosaurs, relatives of the modern lizards, and they were thus placed on the other major diapsid branch, the Lepidosauromorpha. 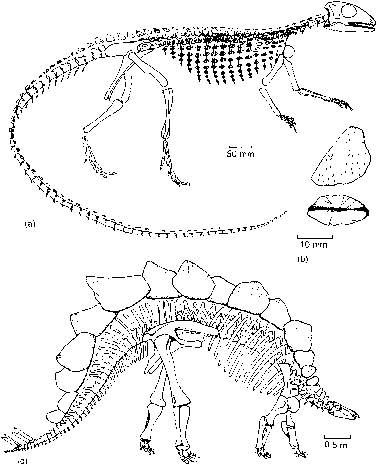 Tanystropheus, for example, shares various features with the lizards, such as its incomplete lower temporal bar (Figure 6.5(h)) and specialized teeth and vertebrae (Wild, 1973). These must be convergences, however, as they are far outweighed by the evidence for archosauromorph affinity.